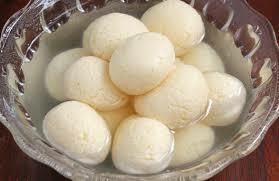 Rasgulla is the king of the Bengali sweets(Rasagola). It is made up of channa. 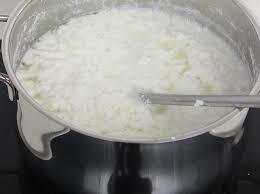 Boil the milk in a vessel, when it is boiling add the lemon juice to it and mix it until the milk curdles. Keep stirring until the water and channa are completely separates. Strain the channa with a clean cloth. Tie the edges of the cloth together. Squeeze the excess water by hanging the cloth above the sink for 1 hour. Now knead the channa(which is very important) to make a smooth dough. 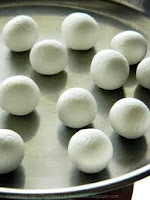 Divide the dough into small equal size balls and and shape into a smooth round ball to make rasgullas. Now in a vessel, make the sugar syrup by adding the sugar and water. Now reduce the heat and add the rasgullas very carefully. Cover it with a lid and cook for 15 minutes. Stir it occasionally. Then put off the flame and let them cool. If you want you can add rose essence. Mixed together wheat flour, coconut milk and salt to make dough and knead into a soft, smooth dough by using require water and divide the dough into equal size balls. Heat oil in a pressure cooker , put ginger garlic paste and sauté for 2 minutes. Then put onion and fry till oil started separating. Put tomato, sugar, salt, cumin and coriander powder and the keema and cook till all masala are mixed properly with the keema , then put gram masala, kewra water , coriander leaves and if require little water. Put the lid of the cooker and cooked till keema is fully cooked and dried up for using as a stuffing. Roll out a ball into circle and put little Masala Kheema in the center and fold the edges properly. Now gently roll again into circle so that the stuffing doesn’t come out. Fry the stuffed paratha in tawa with oil or ghee. Serve hot with raita. Mixed together all the ingredient of dough and knead into a soft, smooth dough by using require water and divide the dough into 6 equal size ball. First boil the chopped potato and cauliflower for 5 minutes and separate it from water. Heat the oil in a kadai and add cumin seeds, when it crackles, put the boil aloo and cauliflower and fry for few minutes. Now add turmeric powder, red chilli powder, chat masala, sugar, lemon juice, chopped coriander leaves and salt to taste and mix well. Cover it with a lid and cook till it is done. Let it cool. 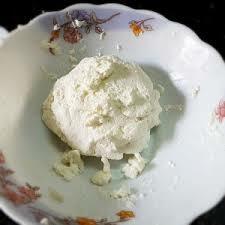 Now roll out one ball into a circle by using oil/wheat flour. Put the require stuffing in the center of the circle and bring together all the sides in the center and seal tightly. Roll it again into a circle very carefully so that stuffing does not come out. 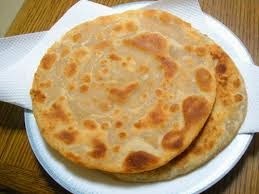 Cook it on a hot tawa by using oil or ghee till golden. Serve hot with pickle and raita. At first we will make the masala which we will use for the balls as well as for the gravy. Put all the paste of the masala in a bowl, all the sauces, honey and salt and mix well. Now for the balls, in a bowl put all the grated vegetables , peas, boil and mashed potato and half of the masala which we have made and mix the cornflower into it and mixed well to make a dough. Now roll it out in your palms to form little balls. Keep the balls in a refrigerator for 30 minutes. After that fry the balls and keep aside. Now to make gravy, heat the oil in a kadai put the onion and sauté a little , then put capsicum, spring onion and rest of the masala. Cook it for 5 minutes, put 1 cup of water to make gravy. When gravy start boiling give the vegetable balls and cook for another 5 minute. 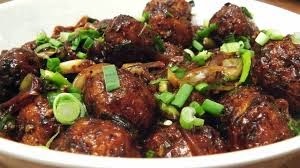 Your vegetable Manchurian is ready , serve it hot with noodles of rice. For making masala for the paratha, heat 1/2 tea spoon oil in a pan and put the onion paste , ginger and chilli paste and sauté for a minute . Mixed the grated carrot,mashed mooge dal, salt, honey and coriander leaves and cook for 2 minutes and keep aside. Now in a bowl put the maida , masala and strive the maida with the coconut milk into a stiff dough just like we do to make roti or paratha . Now roll out in your palms to make medium size ball. 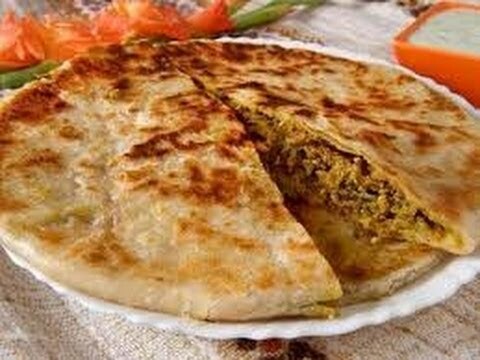 Roll it like a paratha and fry it with little ghee. Serve it hot . 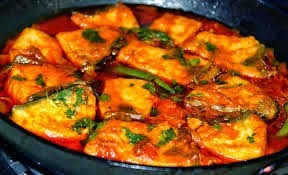 Clean the fish pieces and marinate with salt for 10 minutes. Heat the oil in a non-stick pan. Fry the pieces for 2 minutes and take out from the oil and keep aside. In the same pan put the whole gram masala and sauté for a minute. Put the green chilli and onion and fry till onion turns light brown, then put salt ,ginger paste and 2 table spoon of water and the fried fish pieces and cook till the fish is almost done. In the last put the mixture of tomato sauce and honey and cook for 2 minutes. Serve hot with plain rice. At first in a bowl put the water and a little salt and let it to boil. When start to boil put the noodle and cook for 2 – 3 minutes. Drain the water completely and set aside. In a separate bowl we will prepare the toppings. Put the chopped onion, capsicum, tomato, cucumber, green chilly, chat masala, lemon juice, honey and salt to taste and mixed together properly and keep aside for 5 minutes. Now boil noodles are to be fry. Heat the oil in a kadai. Put a little boil noodles and fry it a little. Strain the noodle in a oil absorber paper. Fry the remaining noodle in the same process. 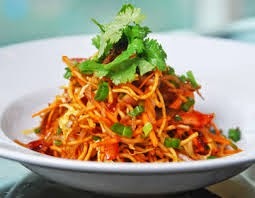 Now in a plate at first put the fried noodles and then the mixed topping,garnish it with coriander leaves. Serve it as a snacks.